In 1762 George III purchased virtually the entire collection of Joseph Smith, the greatest patron of art in Venice at the time. Thanks to this single acquisition, the Royal Collection contains one of the finest groups of 18th century Venetian art in the world, including the largest collection of works by Giovanni Antonio Canal, better known as Canaletto. Joseph Smith (c.1674−1770) was an English merchant and later British Consul in Venice. 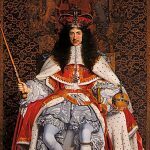 He had moved to Italy in around 1700 and over several decades built up an outstanding art collection, acting as both patron and dealer to many contemporary Venetian artists and was Canaletto’s principal agent. Through over 100 paintings, drawings and prints from the Royal Collection’s exceptional holdings, Canaletto & the Art of Venice presents the work of Venice’s most famous view-painter, alongside that of his contemporaries, including Sebastiano and Marco Ricci, Francesco Zuccarelli, Giovanni Battista Piazzetta and Pietro Longhi, and explores how they captured the essence and allure of Venice for their 18th century audience, as they still do today. The exhibition at The Queen’s Gallery, Palace of Holyroodhouse, will be the largest ever showing of Canaletto paintings in Scotland. 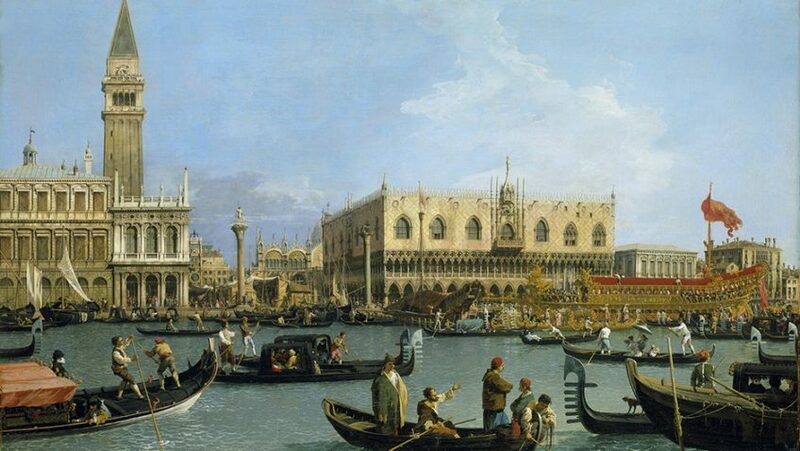 One of the most important of Smith’s commissions from Canaletto was the series of 12 paintings of the Grand Canal, which together create a near complete journey down the waterway. Canaletto’s sharp-eyed precision makes these views seem powerfully real, yet he rearranged and altered elements of each composition to create ideal impressions of the city. Alongside the grand public entertainments, Venice boasted a thriving opera and theatre scene, especially during carnival season. The need to create stage sets within a very short period of time provided plentiful employment for Venetian artists and both Marco Ricci and Canaletto worked for the theatre, learning to manipulate perspective to heighten drama. The exhibition includes one of Ricci’s designs for the Venetian stage, Room with a balcony supported by Atlantes, c.1726. Both Canaletto and Marco Ricci contributed to the development of the genre known as the capriccio – scenes combining real and imaginary architecture, often set in an invented landscape, to create poetically evocative works. 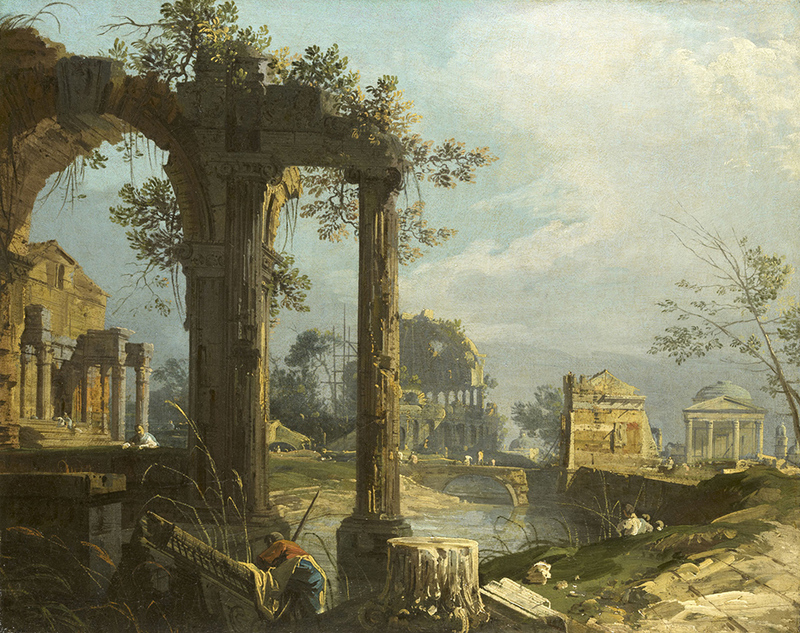 The ruins of ancient Rome in Ricci’s Caprice View with Roman Ruins, c.1729, and of Padua in Canaletto’s A Capriccio View with Ruins, c.1742–4, convey a sense of the irrevocable loss of a great age. 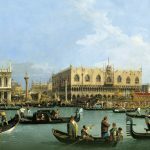 Canaletto & the Art of Venice is at The Queen’s Gallery, Palace of Holyroodhouse from Friday 11th May until Sunday 21st October, 2018. The Royal Collection Trust publishes the accompanying publication, Canaletto & the Art of Venice, priced at £29.95. 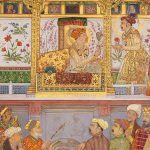 For more information and to purchase tickets for The Queen’s Gallery, Palace of Holyroodhouse, please visit: www.royalcollection.org.uk or telephone 0303 123 7306.